Humans have a great impact on wildlife. Some of it good , but mostly bad. 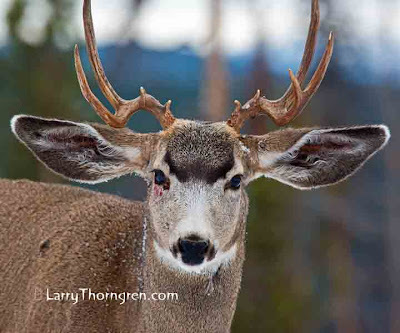 When I first saw this deer in Yellowstone, my first thought was how unique its' horns were and what a great photo I would get. As I looked through my lens however I realized that he was injured. I notified a ranger, hoping the deer could be saved, but the ranger determined that it had been struck by an automobile and that it was going to die, shot the deer and took it away.